If the steady stream of newly announced mass wood projects is any indication, mass timber building technologies are poised to take the American construction and design industries by storm over the next few years. As products like cross-laminated timber (CLT), nail-laminated timber (NLT), glue-laminated timber (glulam), and dowel-laminated timber (DLT) begin to make their way into widespread use, designers, engineers, and builders alike are searching for the best—and sometimes, most extreme—applications for mass timber technologies. But rather than reinvent the wheel, American designers can look to experienced mass timber designers in Europe and Canada for key lessons as they begin to test the limits of these materials in the United States. European and Canadian architects and researchers have long been at the forefront of mass timber design, starting with early experiments in the 1970s. By the 1990s, researchers like Julius K. Natterer at the Federal Institute of Technology in Lausanne, Switzerland, were developing initial CLT prototypes. Natterer’s work has been buttressed by that of many others, including research performed at the Norwegian Institute of Wood Technology under Thomas Orskaug and experiments conducted at the Technical University of Munich under Stefan Winter. One key lesson European timber projects teach is that when it comes to structural systems, weight matters. On average, mass timber assemblies weigh between one-third and one-fifth as much as concrete structures, despite equivalent structural capacities. As a result, mass timber buildings are much lighter than concrete ones, a positive for building in tricky urban situations, for example—where underground rail yards, subway tunnels, and municipal utilities place limits on how heavy and tall buildings can be. London-based Waugh Thistleton Architects (WTA), for example, recently completed work on Dalston Lane, a 121-unit CLT midrise complex located above a tunnel serving the Eurostar train line in the city’s Hackney neighborhood. For the project, the architects worked with timber-engineering specialists Ramboll to develop a stepped tower cluster rising between five and ten stories tall. CLT panels are used for the external, party, and core walls of the building, as well as the stairs and the building’s floors. The variegated massing is due directly to the architect’s use of CLT construction, which resulted in a lighter building that allowed the designers to build taller without more extensive foundations. The resulting building, with its staggered massing, better maximizes daylight infiltration into apartment units. The added height allowed the architects to add 50 more units to the project than originally permitted, a testament to just how light CLT can be. 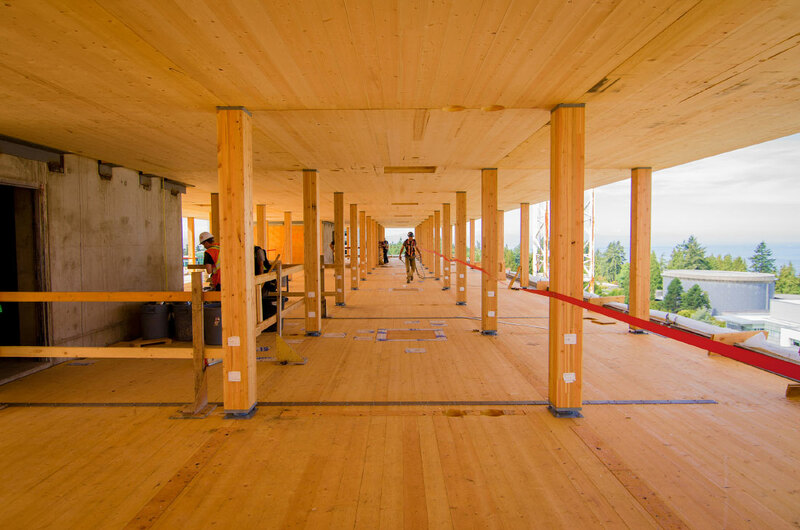 Lighter mass timber buildings also perform better in seismic zones. Since the lighter buildings carry less inertia, the potential for catastrophic swaying goes down. The strategy was applied this year with the Brock Commons tower, an 18-story, 400-bed college dormitory designed by Vancouver-based Acton Ostry Architects for the University of British Columbia Point Grey campus. The tower is made up of a hybrid structural system that includes CLT floor slabs, glulam columns, steel connectors, and dual concrete cores. The concrete cores anchor the light mass wood structure in place, helping to counteract seismic and wind-generated forces. The 173-foot-tall structure is currently considered the tallest mass timber building in the world, and the construction is particularly multifaceted, utilizing a specifically fabricated set of interdependent building materials and finishes to meet structural and fire-safety regulations. The firm is currently developing over ten mass timber projects, an emerging body of work that came out of earlier mass timber competition entries developed by C.F. Møller that took the world by storm. C.F. 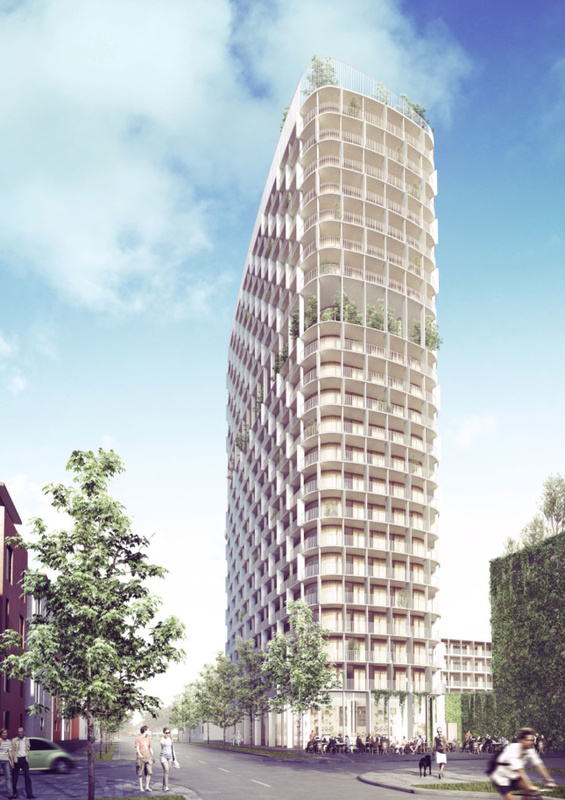 Møller recently entered into a partnership with HSB Stockholm—Sweden’s largest housing association—to design a series of new mass timber housing towers, including the 34-story Västerbroplan tower designed with concrete cores and wraparound terraces. The tower’s columns and beams will consist of a blend of CLT and solid timber. The building’s terraces will come with integrated exterior curtains and will be fully enclosed by a steel superstructure containing glass panels. The tip of the building is designed to dematerialize as it steps back along two facades, creating a series of exposed terraces and planted areas. Like Brock Commons, Västerbroplan tower features a hybrid structural system that is “resource-effective,” according to Jonsson, meaning both lightweight and rigid. 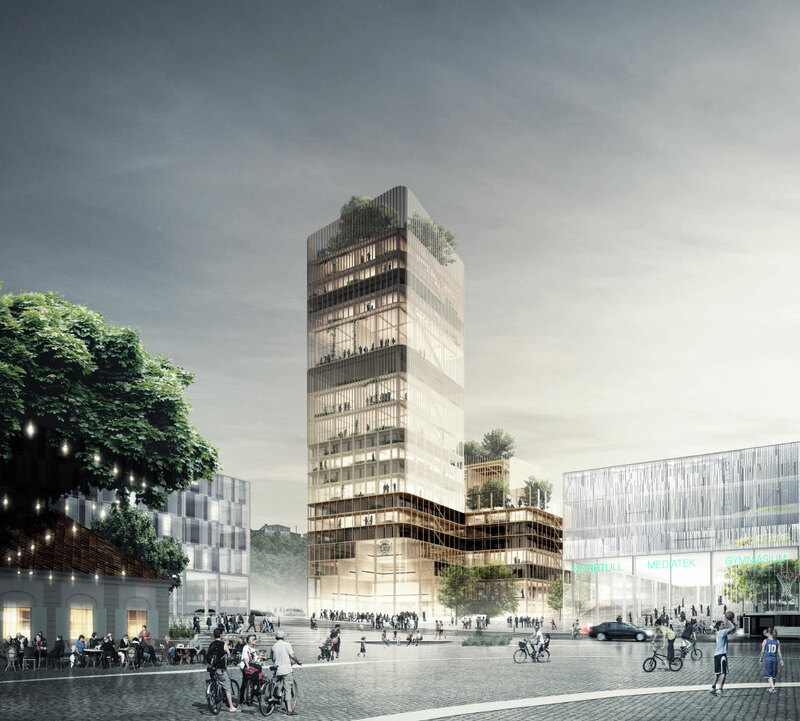 The firm is also at work on a 20-story bundled housing tower called Hagastaden for HSB Stockholm, this one designed as part of a new quarter of the city that will contain mixed uses and generous pedestrian areas. The tower features varied floor heights designed to accommodate divergent uses like student flats, penthouse apartments, and typical family-occupied units. Aside from the firm’s multiple mass timber projects, C.F. Møller is working as part of an interdisciplinary research team that is developing new strategies around mass timber towers rising 20 stories or more. The group—backed by SP Technical Research Institute of Sweden, Växjö Municipality, and Linnaeus University, among others—will investigate mass timber construction from a fire-safety, life cycle, and construction technology perspective. The designers behind Brock Commons utilized Structurlam as the mass timber manufacturer for the project. The advanced level of project coordination and off-site fabrication meant that project was finished roughly four months ahead of schedule, with a time-lapse video on a project website showing construction crews erecting upward of two floors per day. The first story for the project was built from cast-in-place concrete, while the remaining 17 stories are built in mass wood. The structural system utilizes glulam columns, steel connectors, and a two-way spanning CLT flat-slab. The design creates a floor beam–free structure that could be erected start-to-finish in nine and a half weeks. The rapid-fire construction time line, however, comes at the expense of longer planning and design phases prior to any work boots hitting the job site, as the teams must become absolutely synced prior to fabrication. Waugh of WTA explained that often with timber buildings, the firm asks its clients to “give us more time now [in the planning stages of construction] and we’ll save you even more time on the back end.” Waugh added, “The better programmed the construction process, the faster and more accurately the buildings come out.” Waugh said that after erecting several mass timber structures, the firm had “gotten so much better at it” than when they first started. One area of improvement has been material usage, which decreased with each project as the structural capabilities of mass timber have been further explored, tested, and certified. The Dalston Station project mentioned earlier, for example, utilized about two-thirds as much timber as the firm’s first mass timber project erected a decade ago. Part of the reason for the improvements, Waugh and Jonsson agreed, results from designers’ greater awareness of and comfort with the construction process. “To design well in mass timber, you need an architect who wants to understand that the nature of [the architect] is one of a ‘master builder’ as well as one of a ‘master designer,’” Waugh explained. Several projects in the works, like Shigeru Ban’s recently proposed 19-story Terrace House in Vancouver, Michael Green Architecture’s 35-story Baobab building in Paris, and PLP Architecture’s 80-story addition to the Barbican housing estate in London, point toward a wider adoption of tall and supertall mass timber housing towers. 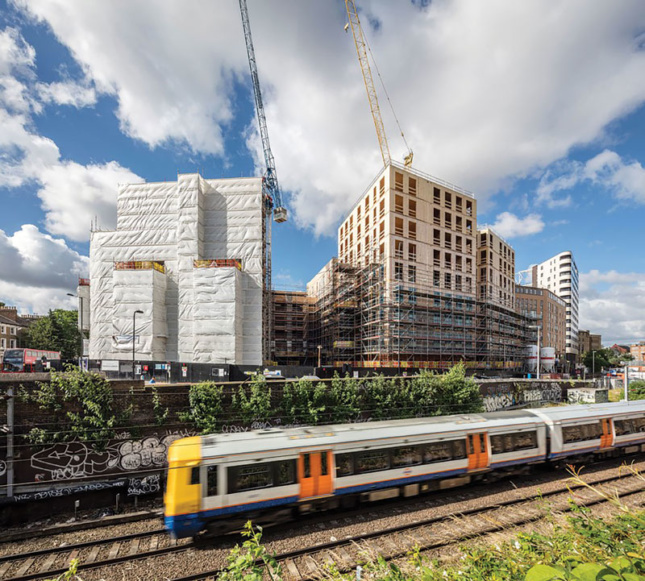 With faster construction times and fabrication that can occur in tandem with permitting, mass timber has the potential to help cities add housing rapidly, safely, and efficiently.